Buoyed by relentless buying by local and offshore investors, India’s stock market capitalisation (M-cap) has crossed $ 2 trillion, making it the 9th -largest equity market globally and second, after China, in the universe of emerging markets, according to Bloomberg data. The spurt in stock prices has pushed up India’s M-capto GDP ratio, a tool used by equity strategists to assess the relative valuation of a market, well above the 10-year average. A runaway bull market looks at ways to endorse the euphoria on the Street. 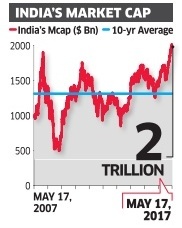 With M-cap-to-GDP at 0.88, analysts believe there is tailwind left in the Indian equity story as markets are perceived to be expensive only when this ratio exceeds 1. 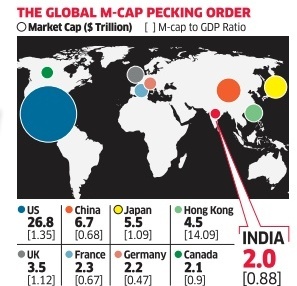 Typically, the M-cap-to-GDP ratio is anywhere between 0.2 and 0.8 for emerging markets while it moves in a wider range of 0.5-2.2 for developed markets. “India has the largest number of listed companies in the world. Interestingly, nearly 50% of the actively traded companies have M-cap of less than Rs. 500 crore. This suggests that Indian companies go public much earlier than in most other large economies. The relatively high M. Cap to-GDP ratio in India, therefore, is reflective of strong appetite of Indian entrepreneurs to access public equity funding and the willingness of Indian equity investors to fund such entrepreneurs,” said Sujan Hajra, Chief Economist, Anand Rathi. For India, the ratio, with a 10-year average of 0.78, had peaked at 1.48 in 2007. Based on such a hypothesis, the local M-cap has to rise another 10% for India to be perceived as an expensive market. Since January, local stocks have generated 28% returns in dollar terms the highest among the top 20 global markets based on M-cap. Emerging markets such as Brazil have among the lowest M-cap-to-GDP ratios.